The FluorSorb-MAXTM cartridge is our latest advancement for removing fluoride from drinking water. This new cartridge removes apx. 20% more fluoride than our previous version (FluorSorbTM) and is superior in comparison to the commonly used synthetic aluminum-based alternative, Activated Alumina. Although Activated Alumina is somewhat effective for Fluoride Removal, comprehensive testing shows that FluorSorb-MAXTM has a significantly greater fluoride removal rate (apx. 50% more) and offers additional benefits such as: Raising Alkaline pH, and filtering various anionic (negatively charged) and cationic (positively charged) contaminants, e.g. : radioisotopes, metals and chemicals. 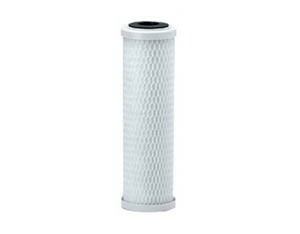 Fits all standard filter housings with minimum of 9.75" Length x 3" Internal Diameter. *Internal testing shows that The FluorSorb-MAXTM Fluoride removal begins to drop by apx. 15% in performance at the following intervals and should be replaced accordingly: At 500 gallons with 0.7mg/L (most common) Fluoride concentration; at 300 gallons with 1.2mg/L; and at 150 gallons with 2.2mg/L. Please check your water quality report or contact your water company to confirm your FL levels. Fluoride removal occurs when water contaminated with negatively charged ions (anions) such as Fluoride, Arsenic or Lithium comes in contact with the media, they are then attracted and attached to the media and/or exchanged for a natural calcium ion, and thereby, removed from the water. *Note: Some water filter companies that claim high fluoride removal % (particularly ones using the questionable Activated Alumina media) may not be providing accurate or honest information and do not disclose that their information may be the result of a controlled laboratory setting where deionized water (water devoid of all substances but H2O) spiked only with fluoride is treated at a very low flow rate to achieve desired result, and the fact that real tap water typically contains dozens if not hundreds of other chemicals which compete for absorption is not factored in, if they did factor this in and tested their media in a practical setting with a reasonable water flow of 0.5 GPM (as we did), they would not achieve the near 100% fluoride removal efficacy of our FluorSorb-MAXTM. Our figures are based on real tap water, at realistic flow rates. 2. Fluoride is a common constituent in many antidepressants including Prozac, in the form of Fluoxetene. 3. USAF Major George R. Jordan testified before Un-American Activity committees of Congress in the 1950's that in his post as U.S.-Soviet liaison officer, the Soviets openly admitted to "Using the fluoride in the water supplies in their concentration camps, to make the prisoners stupid, docile, and subservient." 4. In Germany, Belgium and Luxembourg fluoridation of water was rejected because it was classified as compulsive medication against the subject's will and therefore violated fundamental human rights. 5. In November of 2006, the American Dental Association (ADA) advised that parents should avoid giving babies fluoridated water. 6. A notable study in 1995, performed by Toxicologist Dr. Phyllis Mullenix Ph.D, found behavioral deficits in rats as a consequence of fluoride toxicity. 7. A 1975 study by German Chemist, Dr. Johannes Westendorf Ph.D. determined that Fluorosilicic acid (commonly added to US municipal water supply) was a substantially more powerful enzyme inhibitor than Sodium Fluoride, and that it inhibited the function of various critical enzymes (particularly cholinesterase) within the body. It's interesting to note, that according to various government and medical data, fluoride effects cease to be "beneficial" when below 0.5mg/L (0.5ppm). Hence, we can conclude that if you're looking to avoid the questionable effects of Fluoride (we certainly are), then our FluorSorb-MAXTM cartridges are a powerful natural solution for one of the most difficult to remove aqueous contaminants. As a secondary benefit, FluorSorb-MAXTM can adsorb a broad spectrum of chemicals, heavy metals and some radioisotopes. This cartridge size is 9.75" Height x 3" Diameter.